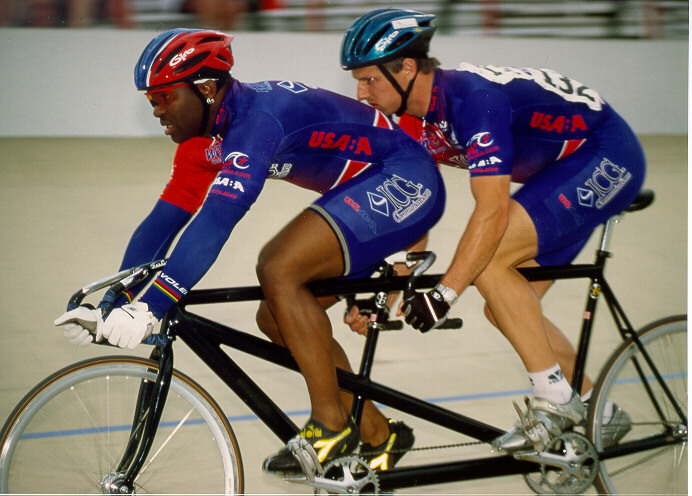 Kirk Whiteman and Matt King win the Men's Match Sprints at the 2000 Paralympic Trials in Frisco, Texas. About Kirk: In the fall of 1983, Kirk Whiteman, while flipping through channels, saw a native New Yorker named Nelson Vails win a gold medal at the Pan American Games in the sport of cycling. Captivated by the speed and power of these sprinters, Kirk, not long after, realized that cycling was his calling. Not knowing anything of the sport, Kirk did hear that Nelson Vails was a former NYC bike messenger turned pro bike racer. Whiteman, like Vails, started off by getting a messenger’s job in Manhattan, linked up with one of the best amateur cycling teams in the east, and he too has risen through the competitive ranks and has become a champion. Since 1990 Kirk has medaled at just about every National Championship he has entered. In 1996, he won his first National Championship in the Tandem Sprints. A year later, he traded in the Stars and Stripes national jersey for the Rainbow colored jersey of a World Champion in the Individual Match Sprint Event at the Masters World Championship in Manchester, England. In 1998, Kirk successfully defended his individual match sprint world championship, he also set a world record and won a gold medal in the Olympic Sprint Event. Kirk’s reign as world champion has been more monumental than just winning. In 1997, Kirk was the first African-American to win a world sprint title since Major Marshall Taylor in 1899. In 1998, Kirk became the first two time African-American winner of that title in the hundred plus years of cycling. Apart from a brilliant career in cycling, Kirk has been reaching out to the children and athletes in the community. He finds that there is a definite importance to teaching children that there is freedom in discipline when striving to attain their goals. Elite Track Championships, Frisco, Tex., placed first in the men’s USABA kilometer..made the 2000 Paralympic Cycling Team which will be going to Sydney, Australia, in October of 2000. Masters World Track Championships’, Manchester England, won the match sprint, won the 200 meter time trial, and placed third in the Olympic Sprint.